Optics, the study of visible light, is one of the earliest branches of science. An introductory physics class will usually highlight what happens when a light ray encounters a new medium. 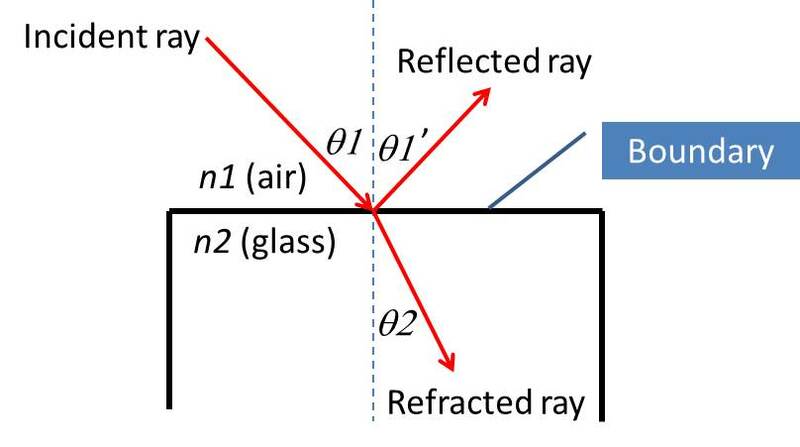 That is, a light ray may be travelling in a straight line unperturbed through medium 1, air, when it suddenly encounters medium 2, a thick plane of glass. Before the light ray strikes the boundary, it is referred to as an incident ray. The incident light ray will divide itself upon striking the new medium: some of the ray will reflect, and some of it will refract. The reflection of a light ray is simple - it is no different than what happens to a billiard ball when it strikes a band. Just as a billiard ball rebounds off of the flat border with an angle equal to that which it struck with, the angle of the reflected ray is equal to the angle of the incident one. However, light can also permeate the new medium (an ability that no billiard ball possesses). The portion of the light that passes through the boundary, continuing its travels into medium 2, is referred to as the refracted ray. 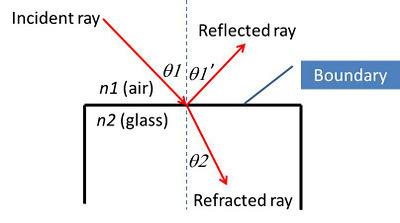 As shown in the figure below, the angle of each ray is measured with respect to an invisible 'normal' line, which is drawn perpendicular to the surface. *** Disclaimer: Do not wet your finger and plunge it into a live electrical outlet. The title of this article was intended to be a play on words. You know what? If that was not already obvious to you, a severe electrical shock might do you some good. Some science students are initially baffled when studying electricity. This is not so surprising, as it is hard to relate to the concept of current, the rate of flow of charge. The charge that is transported through an electrical circuit is composed of electrons - many of them. I have never seen an electron, and while I have felt a charge by means of electric shock, I have trouble sensing exactly how many Coulombs are being transferred to me (or are they being taken from me? I can never tell.). I have an easier time visualizing, say, mass than I do visualizing charge, and I imagine this to be true for most people. This is why it is appealing to explore the analogy between electrical current through a circuit and fluid flow rate through a system of pipes. As a student, I could never remember whether current was constant through resistors connected in series or parallel. The answer becomes obvious when one considers the flow rate of water through pipes rather than the current through wires. There are two things that I associate with the Fall season: Halloween and raking leaves. While the former brings out my inner child who yearns for costumes and candy, the latter is the focus of this article, as it provides a wonderful illustration of the second law of thermodynamics. Ah, the second law... Personally, I have never been particularly drawn to the study of thermodynamics, but I have always had an affinity for the second law and all of its fascinating philosophical implications. The zeroth law of thermodynamics discusses thermal equilibrium, and in so doing, gives meaning to the term temperature. The first law describes the conservation of energy, and dictates that energy cannot be created nor destroyed. The second law says, in a variety ways, that no system can be 100% efficient, and as such, every system has losses. If you are curious, the reason that there is a zeroth law is that it was developed decades after the first two, but precedes them in terms of scientific principle, in that it lays a foundation for further study. Rather than shift laws one and two up to two and three, it was decided that they be left alone, and that the new law be referred to as law zero. This was a great choice, because it gave scientists the opportunity to use the term "zeroth", and as a result, sound very intelligent. In summary, law zero says there will be lunch, law one says that it will not be free, and law two says that actually, you have to tip. Labels: automn, chaos, entropy, raking leaves, randomness, second law of, Thermodynamics, time.